Just like basketball, for me, art is a passion force. I love to be around it, I love to expand my knowledge on it, and I love to enhance the careers of emerging artists. Basketball is similar. I love the game of basketball, I love to be around the sport, and I love to help young players develop into great basketball players. I was only 21 years old (and playing for the Phoenix Suns) when I started to get a taste for art. After a friend gave me a brilliant painting for my birthday – and after realizing how much I enjoyed displaying it on my wall – I wanted more. My interest took off from there, and I really started reading, learning and exploring the art world. At that point, I just wanted something that was cool and hip, something that was fly and intriguing to my friends. Since then, my knowledge of art and artists has grown tremendously. I still love a fly piece that looks great, but the artist itself has become much more important to me. I want to understand the artist’s mindset and know what each particular piece is all about. Today, I have about 70 works in my Miami home, including pieces by Basquiat, Warhol, Brantley and Pruitt, as well as from many up-and coming-artists. It’s all part of the Melech Collection, which is comprised of anything I do in the art world (my personal collection, community initiatives, etc.). There’s just something about art…a certain emotion and elegance that comes along with seeing a painting that resonates with me. I want the art on my wall to have something positive to say, to have a positive energy and impact on my family and friends. The message most of my most art sends is, “Welcome to the Fly Zone.” Everything is fly. I want paintings from artists who are known to be very hip. I like everything to be as fly as my fashion collection. It works hand in hand. Fortunately, the Miami art scene is great. It’s also very, very underrated. There are so many amazing artists who have developed here and so many intriguing, hip art enthusiasts, as well as great places to view art. From Wynwood Walls to Little Haiti’s developing art community, there’s a lot going on here. And there’s so much room to grow. Of course there are a lot of brilliant minds in New York. I’ve met some of the top artists in the world in that city. And you know what, Dallas is not a bad place for art, either. It’s kind of an emerging art scene. One of my favorite things to do is check out museums all over the world. Even during the NBA season, as soon as our plane touches down (and if we have free time), I head off to visit a local art museum. I’m not sure what other players are up to, but I just grab a brochure and go. I can spend hours and hours walking around studying art…looking at what the artists used to paint the piece, the year it was painted, the genre. I love the Art Institute of Chicago. The Royal Ontario Museum in Toronto is great. The new Whitney Museum of American Art in New York is one of my favorites. This is truly my joy. I wanted to share this joy by giving back to the community, which is why we launched the “In the Paint” series, a double-entendre playing on both basketball and art terminology. Through this initiative, we team up with emerging artists to set up workshops in their local neighborhood community center or school. We bring in a basketball installation, and the kids alternate between painting on the canvases and playing basketball. The funds we raise through the Amar’e Stoudemire Foundation are then donated to these places. So far, the children love it. Art gives them a sense of hope and an avenue to get away from the impoverished areas in which they live. Through painting, they can clear their minds and tap into their creativity. It’s also another opportunity for them to create an occupation to strive for besides a basketball player or musician. There are so many different ways you can become successful, and I’m trying to show them options that allow them to step outside of their box and become something more. There are a handful of other athletes out there (that I know of) who share my passion for art. Juwan Howard has a great collection. Grant Hill has a pretty good collection. Carmelo Anthony has a nice collection. And my two rookies here in Miami, Justise Winslow and Josh Richardson, have showed a lot of interest in learning about it. Those young guys are finding art very intriguing, and it’s great to see them develop that understanding at a young age. I show them different pieces and talk to them about my collection. I’ve been explaining to them that not only is art the perfect enhancement to your home, but first and foremost, it’s a great investment. You can’t go wrong if you buy a nice piece of art. Like fashion did some years ago, art is starting to gain more interest among professional athletes. And I hope that continues to grow. Art is culture. The NBA is culture. And both are an international brand. It only makes sense to bridge the gap and bring these two great cultural influencers together. We just need to connect the dots, and I want to be the guy who helps to do that. 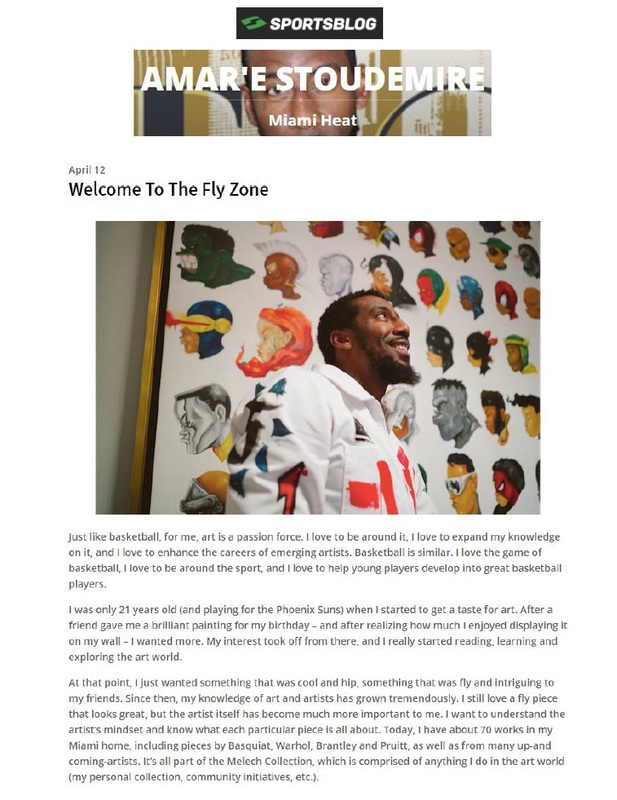 Last Wednesday, April 6th, Miami Heat Star and art enthusiast Amar’e Stoudemire and artist Daniel Arsham hosted a Miami “In The Paint Series” event in collaboration with Whitewall Magazine. The fête, held at the Ritz Carlton Residences Miami Beach, was to benefit The Amar’e Stoudemire Foundation. Guests participated in a live interactive art installation by artist Tatiana Blanco and enjoyed special hors d’oeuvres and Perrier-Jouët champagne. At the close of the evening, Stoudemire and Arsham announced their plans for future collaborations. Among attendees were Matthew Chevallard of Del Toro, George Bramford of Bramford Watch Dept., Whitewall Magazine’s Michael Klug and Ritz Carlton Residences, Miami Beach developer Ophere Sternberg.